The Rocky Fire in Lake County has proved difficult to contain. If you watch the news, it looks like the entire state of California is on fire. It's a bad wildfire season, to be sure, thanks largely to a record-breaking drought. There are now more than 20 active, large fires, the largest of which is the Rocky Fire in Lake County, just north of Napa Valley. 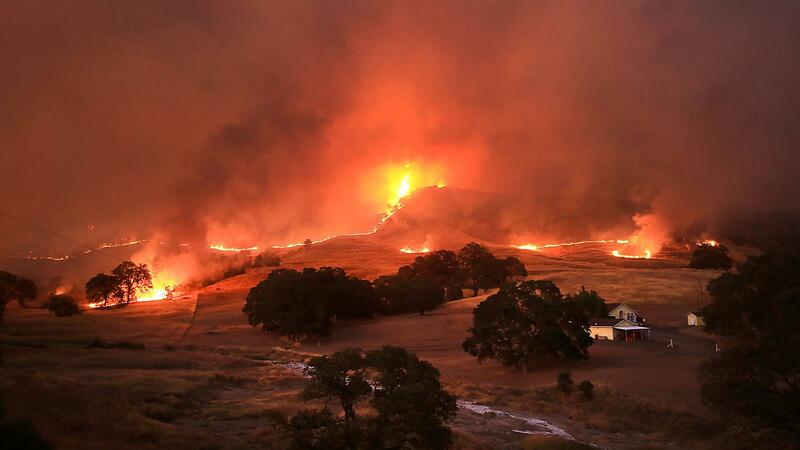 So far the Rocky Fire has scorched 65,000 acres and destroyed 24 homes. It was only 12 percent contained on Tuesday and Cal Fire doesn't expect to have it contained for at least week. Gov. Jerry Brown declared a state of emergency. Grapegrowers and winemakers have been lucky so far, although they're keeping an eye on the skies. Only Six Sigma Winery, according to media reports, was part of an evacuated area, but there was no property damage. The fire also forced the closing of a section of Highway 20, effectively blocking access to some other area wineries. Napa-based grower Andy Beckstoffer has 1,500 acres planted in Lake County's Red Hills and has been keeping a close watch on the blaze. "The fire is south and east of Clear Lake and all of Red Hill is on the west side of the lake," Beckstoffer said. "The wind is blowing east now so it looks like it's going the right way for us." A dramatic shift in wind direction or an extended heat spike could change everything. Of course, a few nice inches of rain would help, although that might not be good for the vineyards at this point in the season. The location of the fire is both good and bad. It's good because it's a sparsely populated area, and bad because the terrain is so rugged and mountainous that firefighters struggle to gain access to it. Tanker planes and helicopters are working to douse it but, that said, 3,100 firefighters are on the job. Smoke taint remains a possible concern. Grapes have a way of absorbing smoky qualities if exposed to smoke for extended periods. As any winemaker who harvested grapes from Mendocino after the big blaze of 2008 can tell you, that taint often makes it into the wine. In Red Hills, at least, the smoke has been minimal, so Beckstoffer isn't worried. It's still early in the wildfire season in California, unfortunately. A lot can still happen. For now, growers are crossing their fingers, hoping to make it through harvest, then the predicted El Niño rains might finally save the day.